This is another interesting news about Cydia jailbreak for latest iOS versions. Famous hacker in these days, Luca Todesco has published a new video demonstration of his jailbreak iOS 9.2, iOS 9.2.1 & iOS 9.3 beta with Cydia. Before this, Todesco had revealed iOS 9.2.1 (beta) jailbreak with posting a screenshot of Cydia running iPhone on iOS 9.2.1 as well as iOS 9.3 (beta) jailbreak with a Cydia running video demo. “finally got untether working somewhat decently”, Todesco says that untether working better. 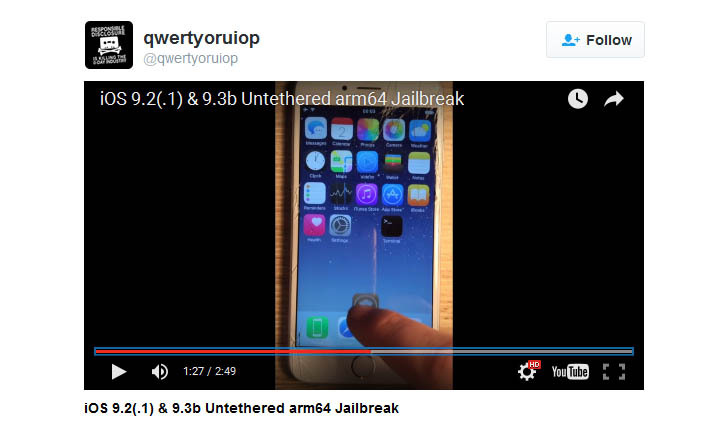 He claims that untethered jailbreak works also on iOS 9.2.1 and iOS 9.3 as well. When iOS 9.3, 9.2.1 & 9.2 jailbreak release for the public? What is the Cydia available latest iOS version? Pangu released first jailbreak solution for Apple’s new iOS 9 firmware to Cydia download for iPhone, iPad & iPod in few months ago. It was only worked for iOS 9.0 – 9.0.2 devices, because Apple patched Pangu 9 jailbreak with iOS 9.1 version update. After that we are waiting long period of time without jailbreak for iOS 9.1, 9.2, 9.2.1. ‹ Apple TV, Can jailbreak your Apple TV 4, Apple TV 3, Apple TV 2 ? Jailbreak tools released for public up to iOS 9.1. This demonstrated solution not released for public. So wait.. Jail broken on IOS 8.4 is it worth it to upgrade to 9.0.2 and Can I still download 9.0.2 from somewhere. i have iphone 4s i updated it’s version to 9.2.0 and now i want to change it’s version to 8.0 ,, but i cant because appear 3004 error while using itunes for this perpose … can u help me ?? Sorry.. You are unable to change version for iOS 8.0. Apple closed downgrade gate. You can’t downgrade, apple has not signed off on it yet so you can’t go down, you can only go to 9.3.1. My I pad version is 9.3.1 and I can not download cydia can u help me plz? Sorry, You are unable to install Cydia for iOS 9.3.1 now. my iphone 6 version is 9.3.2 and I can not download cydia can u help me plz? How to get cydia on iOS 9.2.1. Plz sent me. For 64-bit devices – How to download Cydia for iOS 9.2 – 9.3.3 with Pangu jailbreak? For 32-bit devices – How to download Cydia for iOS 9.1 – 9.3.4 with Home Depot jailbreak?